This work is a postcard that was made for one of the many World Fairs that were popular in Europe during the 19th century. 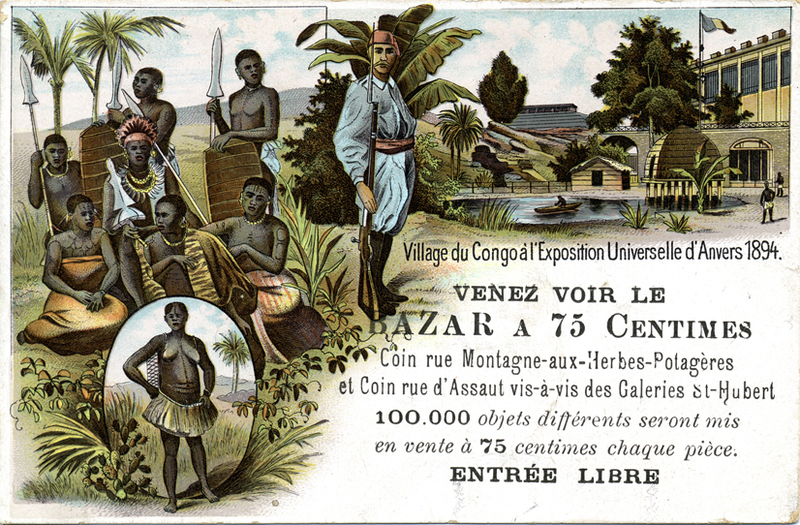 This Fair – the Exposition Universelle d’Anvers – contained a replica Congolese village which exhibited live people from the Congo; the Congo became a Belgian colony in 1885, the same year that such an African “village” was first displayed. 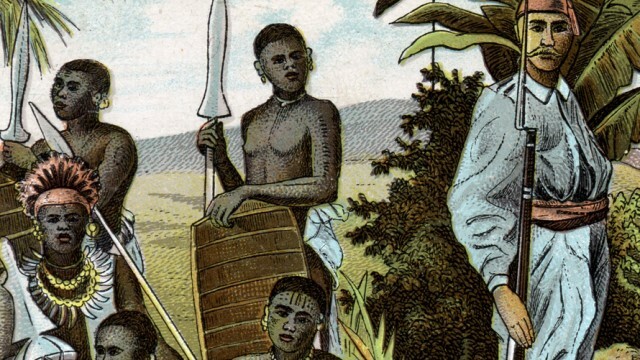 These displays, known as “human zoos,” were meant to be both amusing and educational. Despite publicity materials emphasizing their “authenticity,” these zoos were, in reality, highly artificial spectacles that degraded the people on display. To make them seem more primitive, “villagers” were exhibited half-naked and forbidden from wearing Western clothes. These people were also made to perform traditional crafts and activities and act out scenes for the public. By making the Congolese seem in need of “civilizing,” human zoos thus acted as a justification for Belgium’s colonial presence in the Congo. The Congolese village exhibit was so popular that a museum – the Royal Museum for Central Africa – was built in its location in 1997, a museum that continues the colonialist tone of the human zoos to this day.